Proving that a hard work really does pay off, rowdy Toronto punks Pkew Pkew Pkew (gunshots) have inked a deal with Royal Mountain Records. Known for their raucous, shout-along live shows, the band should be delivering some new recorded material soon, allowing fans to keep the party going in the comfort of their own home. Following the release of Glory Days back in 2013, the band shared a new single called "Before We Go Out Drinking" last year. Now, a statement from their new home label has confirmed that Pkew Pkew Pkew (gunshots) are in the studio working on a new album. They're still keeping the live momentum going, though, with a show scheduled for April 1 at Toronto's Horseshoe Tavern alongside Nashville rockers Diarrhea Planet. We are proud to announce the signing of Toronto's punk band PKEW PKEW PKEW (gunshots) today! 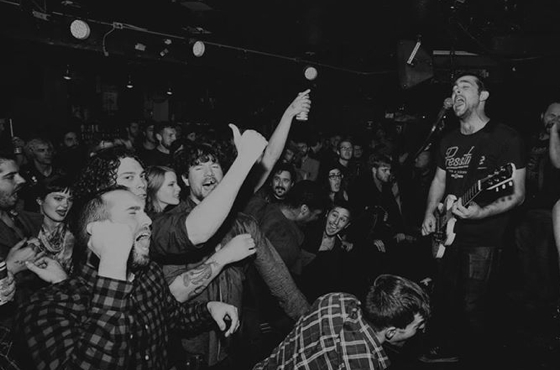 These guys are known for their catchy sing-along punk rock anthems and putting on one hell of a live show. They are currently in the studio working on a new record and their next Toronto show is at the Horseshoe Tavern April 1 w/ Diarrhea Planet. Listen to "Before We Go Out Drinking" below. At this point, it's unclear when the new album will arrive.